WASHINGTON, DC, April 25, 2012 (ENS) – The first Green Ribbon Schools were honored Monday in a new federal recognition program established by the Obama Administration. The 78 honored schools in 29 states and the District of Columbia exercise a comprehensive approach to reducing environmental impact, promoting health, and ensuring a high-quality environmental and outdoor education. The point is to prepare students with the 21st century skills and sustainability concepts needed in the growing global economy. The 78 schools awarded Green Ribbon status were selected from among nearly 100 nominees submitted by 30 state education agencies, the District of Columbia and the Bureau of Indian Education. In total, the Green Ribbon schools are include 43 elementary, 31 middle and 26 high schools with around 50 percent representing high poverty schools. Among the list of winners are 66 public schools, eight charter schools and 12 private schools. 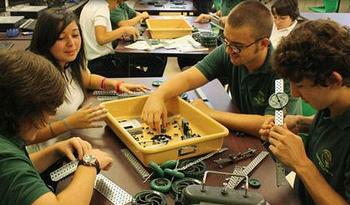 The two Green Ribbon Schools in Hawaii demonstrate why the honored schools were selected. 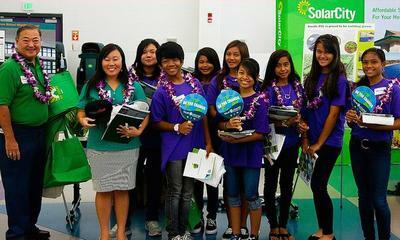 The Ewa Makai Middle School in Ewa Beach is a new school built to the U.S. Green Building Council’s LEED [Leadership in Energy and Environmental Design] Gold standard, making it Hawaii’s first green public school campus. The Hawaii Preparatory Academy in Kamuela won for its first of its kind energy lab that received a LEED platinum rating and its net-zero energy profile achieved by utilizing solar panels. “We’re honoring schools that use green roofs, pervious pavement, rain gardens, rain barrels, rain cisterns and low-flow water equipment of all types. At some of the winners, the buses run on ultra-low sulfur diesel, compressed natural gas or the discarded cooking oils of local restaurants,” wrote Duncan. “Their conservation efforts extend from the cafeteria to the classroom, as they devise reusable snack bags and water bottles; dine with reusable plates, napkins and utensils for meals; and save paper by converting to digital assignments and grading,” he blogged. In Portland, Oregon, the K-8 Sunnyside Environmental School earned a Green Ribbon for its Adopt A Park program, its rotating curriculum themes of river, mountain and forest, its curriculum based camping trips, school gardens and compost bins. In Miami, Florida, the TERRA Environmental Research Institute earned a Green Ribbon although it just opened in 2009. Housed in a LEED Gold-certified building, classrooms are equipped with the latest computer and research labs, Promethean boards for interactive learning, surround sound systems and greenhouses. Inspired by global environmental conservation initiatives, TERRA students lead advanced scientific research projects, establishing connections between their research and the community through active service. In Omaha, Nebraska, 400 students in pre-kindergarten through fourth grades attend the Green Ribbon awarded Lothrop Magnet Center, known for its science and technology programs. Students are involved in constant science investigations in the fields of meteorology, botany, animal and human body functions, chemistry, geology and space technology. At Stoddert Elementary School in Washington, DC, where the winning Green Ribbon Schools were announced on Monday, grades four and five study the local Chesapeake Bay watershed environment. Ten years ago, the Chesapeake Bay Foundation and National Geographic’s Geography Education Outreach formed a partnership to provide professional development and materials for Stoddert teachers that is still active. “Schools that take a green approach cut costs on their utility bills, foster healthy and productive classrooms, and prepare students to thrive in the 21st century economy,” said White House Council on Environmental Quality Chair Nancy Sutley at the annoucement ceremony. “These Green Ribbon School award winners are taking outstanding steps to educate tomorrow’s environmental leaders, and demonstrating how sustainability and environmental awareness make sense for the health of our students and our country,” said Sutley. The Green Ribbons are one-year recognition awards. Next year’s competition will open in summer 2012. State agencies are encouraged to send their intents to submit nominees by June 15, 2012 via email to green.ribbon.schools@ed.gov.